South African President Jacob Zuma abandoned a Mayday rally on Monday after he was booed and jeered by trade union members demanding he step down. 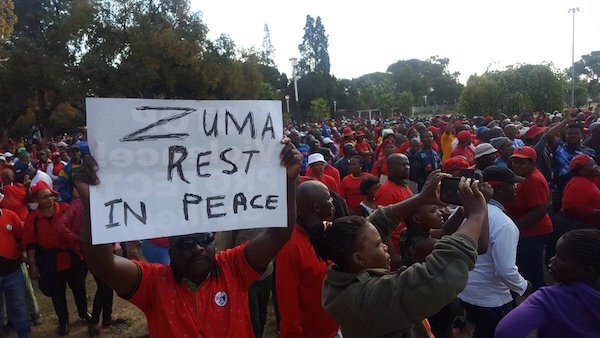 He was heckled by crowd members who sang anti-Zuma songs as he prepared to speak at the rally in the central city of Bloemfontein, organised by the country’s powerful Cosatu trade union federation. Organisers terminated the event at the Loch Logan Park and no other speakers were permitted to take to the stage to address the crowd of thousands. Zuma was shown on live TV hastily leaving the event in a heavily secured motorcade. Scuffles broke out between some members of the crowd calling for Zuma to step down and others who were chanting in support of the president, local media reported. Zuma had been due to share a stage with Cosatu president Sidumo Dlamini and South African Communist Party general secretary Blade Nzimande. Organisers’ attempts to calm the crowds were unsuccessful. “It is sad that after a successful march which was well attended by the workers… chaos from members prevented us from proceeding with the programme,” Dlamini told the News 24 website. Cosatu, a key coalition partner of the ruling African National Congress (ANC), last month called for embattled Zuma to resign following a deeply unpopular cabinet reshuffle. Cosatu’s largest affiliate, the National Health Education and Allied Workers Union, wrote to Cosatu ahead of the event demanding that Zuma be replaced as the keynote speaker by his deputy, Cyril Ramaphosa. Cosatu, along with the SACP and the ANC, was at the forefront of the effort to dislodge white-minority rule in South Africa that led to non-racial elections in 1994. It has openly backed Ramaphosa, who led Cosatu during the anti-apartheid struggle, to succeed Zuma in 2019 when the president must stand down. Zuma’s cabinet overhaul exposed deep divisions within the ANC, and officials from the main opposition Democratic Alliance (DA) party are hoping to recruit enough support from ruling-party MPs to unseat the president if there is a vote of no confidence.